Squeeze the two lemons – getting as much juice as possible. Whatever you get there – add an equal amount (or a tad less) of olive oil. Season with S&P. Add a splash of balsamic, if you like. In a dry pan, toast the walnut pieces until they become aromatic & just begin to brown. A minute or 2. Set aside off of heat. Toss the sliced apples, fennel & arugula & nuts. Fennel is a divisive vegetable. The sharp licorice flavor is either something you love or hate, it seems. 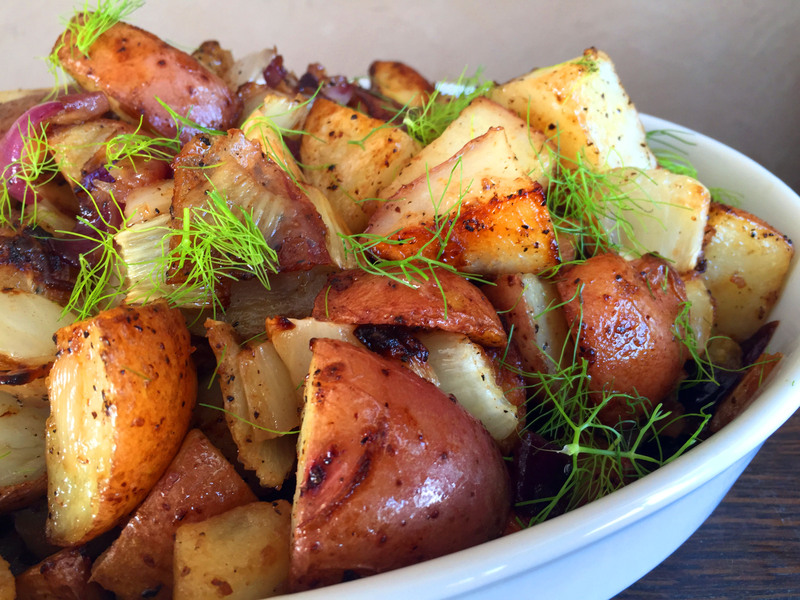 But, as with garlic, the flavor of fennel mellows into something else entirely – when you roast it. It becomes soft & sorta sweet & it compliments this salad nicely. I used arugula but any mixed greens or baby spinach would work, too. I added pistachios but any nuts would work – especially if you toasted them a bit first. I used this lovely blood orange olive oil but regular olive oil would work. I used the dark balsamic – but white balsamic would be lovely, too. And for the goat cheese – I used this stuff (below). It has the texture of a soft goat cheese & was really delicious. If you eat cheese – real goat cheese or feta would also work. Wrap the beets in foil. No need to even wash them – as that will happen later. If they are large (mine were about the size of ping pong balls) – cut them into smaller chunks. Cut the fronds off the fennel (saving some of the dilly leaves for garnish) & cut the bulb in half. Place on a cooking sheet & drizzle with olive oil. Place the beets in foil on the cooking sheet with the fennel & roast 30-45 minutes or until the vegetables are soft. The beets might take longer than the fennel. When the beets cool – wash them under running water & rub the skins off. Cut into bite-sized pieces. Place some greens on each plate. Top with beets, fennel, avocado, pistachios & crumbled cheese. Drizzle with olive oil & balsamic. Garnish with fennel leaves and S&P. 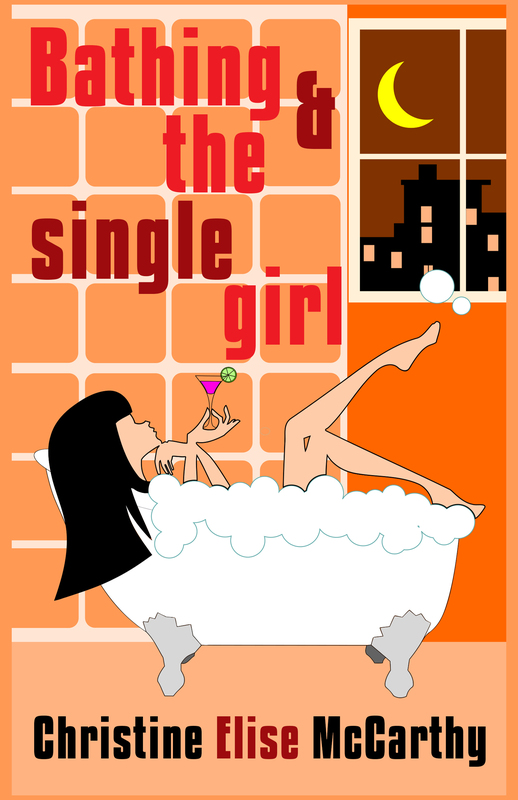 All my posts now have a VERY customizable PRINT & PDF option. 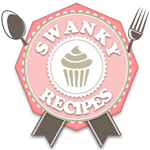 Create a PDF & save the recipe to your computer or just print it out. It offers a “remove images” option & you can delete any part of the post you do not need before printing. The button is below by the Twitter & Facebook links. I get Farm Fresh To You deliveries every other week. You are allowed to customize the deliveries but, sometimes, I forget and the result is that I end up with an infinity of leafy greens. This week: two kinds of lettuce, Swiss chard & kale. And fennel. And more. But thatsalotta greens! Plus, I already had fennel from the last delivery & about 5 pounds of spinach. So – I decided to make something that would use as many of the greens as possible – this dish. The greens you use can vary but you need a lot of whatever you select because they reduce dramatically. I used real Parmesan in this (because I had it) but vegan Parm – or even another vegan cheese (like mozzarella or cheddar) would work. I used almond milk but I think a thicker milk might have been better. NOTE – Also – you might want to add some cheese to the veggie mix. I didn’t because I was trying to keep this dish on the light side. Melt TWO of the five TBS of butter in a large stock pot. Add the fennel and onion & saute until soft. Add thyme & combine. Add the garlic & stir for a minute. Add the greens – in stages – adding more as each bit wilts. Add the flour & milk & bring to a boil. Reduce to low & simmer as it thickens a bit. Add the beans & season with S&P. If you are adding cheese to the veggies – do that now & stir to combine. Meanwhile – melt the remaining 3 TBS butter & toss with the breadcrumbs and 1 cup of cheese. 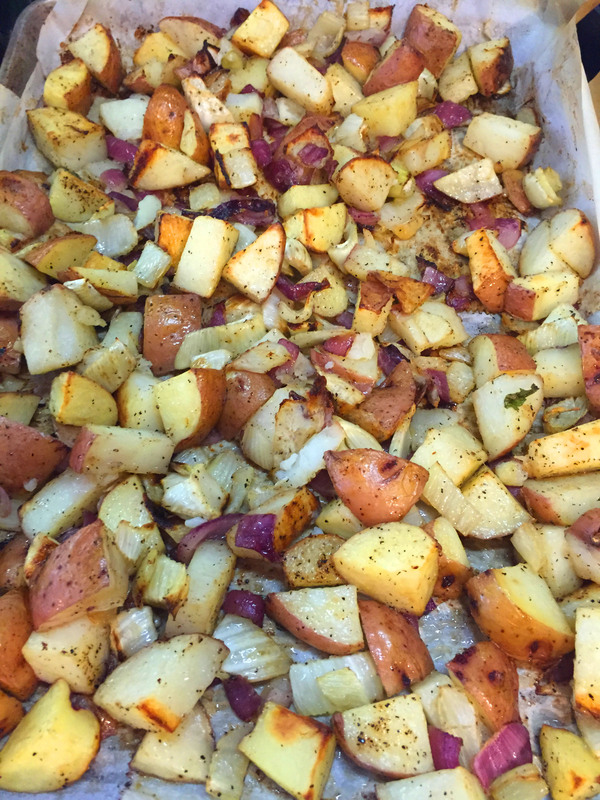 Treat a 9 x 13 casserole pan with cooking spray or oil & put the veggie mix in. Top with the breadcrumb mix. Bake for about 30 minutes or until breadcrumbs turn golden. Let rest 10 minutes & serve. Ah, pizza! This is not really a recipe – in that the quantities you use of each ingredient is up to you – as is the sauce you use & the dough you use. I roasted the mushrooms – seen above (that recipe is HERE) and the fennel – but you could slice them very thin & use them raw. I used real mozzarella here but your favorite vegan cheese will do. It is pizza and pizza loves you no matter what. Roast the mushrooms as outlined HERE – of just use them raw. 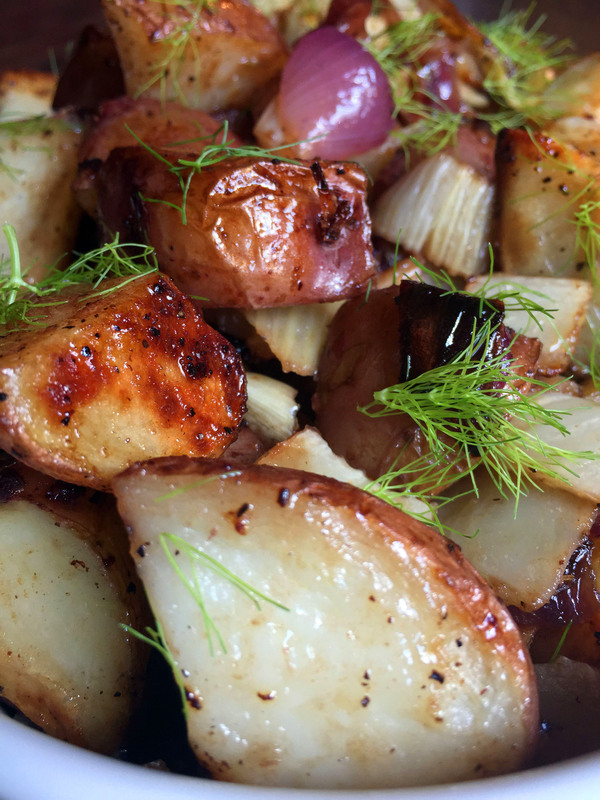 To roast the fennel – heat the oven to 400. Toss the fennel slices with a little olive oil & a bit of salt. 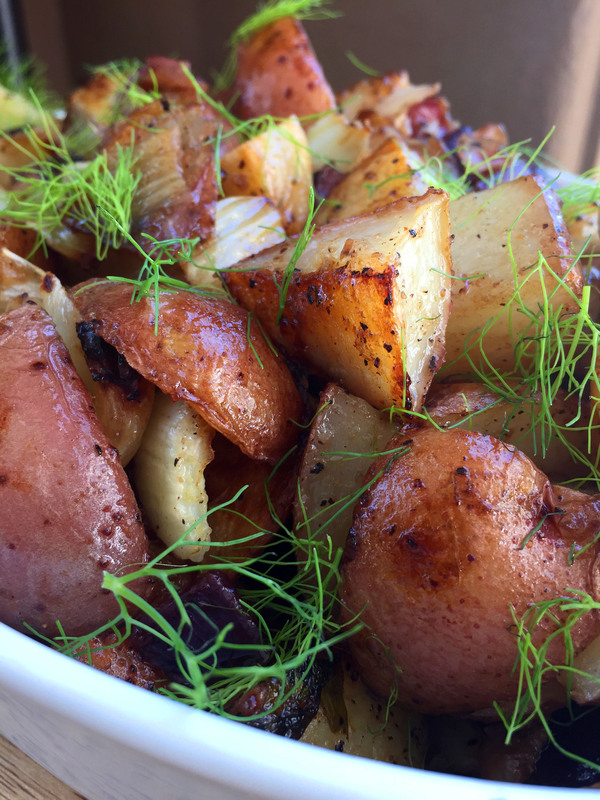 Roast for 10-20 minutes – or until the fennel is soft & just turning color. Heat the oven to 450-500 degrees. I love parchment paper as nothing sticks to it so I recommend it highly. If you don’t have any – lightly grease your cooking sheet. Roll out the dough & put it on the sheet. Top with sauce, fennel, mushrooms & cheese. Cook for about 12 minutes or until the crust is golden & the cheese is melted. 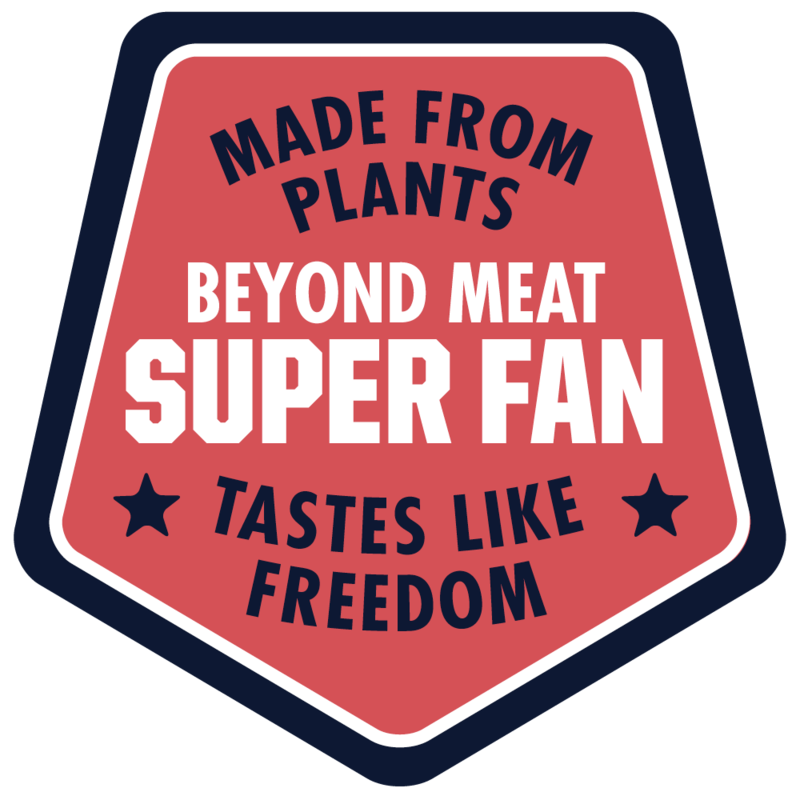 Add the basil & get busy getting your eat on! These are not technically a purists version of a tea sandwich – as most tea sandwiches use white bread & have the crusts cut off. And – you can opt to do that with these but I thought some healthier bread would be nice & I like the crust of the bread. I used Ezekial 4:9 Low Sodium bread but you can use whatever you like. I also used Tofutti brand vegan cream cheese. You can use your own favorite brand. And – I used thinly sliced cucumber & fennel & a few arugula leaves – and this was quite a yummy lunch. This isn’t really a recipe – as you can pile as little or as much of each ingredient onto your bread as you desire. I’m just making suggestion about the flavor combo. This sort of light sandwich is traditionally served with tea in the afternoon – to stave off appetites until dinner. Spread some cream cheese on both pieces of bread and add S&P. Top with the veggies & assemble the sandwich. Cut crusts away if you prefer. Slice up the sandwich. Eat – especially with some nice hot tea. It is Dang That’s Delicious’ Pizza with Caramelized Fennel, Spinach and Goat Cheese. Their photos are prettier than mine – in part because I shot mine at night on my stove top with a clamp light & nothing else – never the prettiest way to go – and (I think) because they used a lotta cheese on theirs – more than I did on mine & their fennel strips remained pale green-white while mine browned – so my pizza is darker – also not always the prettiest thing. I also used this super low end mozzarella that came in roll-up strips & browned more the way marshmallows do – rather than how cheese typically does. No matter what the pictures say – or your preference for a lot or a little cheese – this pizza was DELICIOUS! So – if you find yourself with this combo of things in your fridge – you cannot lose with this pizza! A handful of semolina (my favorite) or other flour for rolling the dough out. 1. Preheat the oven to 500F degrees. 2. Heat 1-2 tablespoons of olive oil in a large sauce pan over medium heat. Saute the fennel for 2 minutes on one side. Then flip and cook for another 2 minutes. 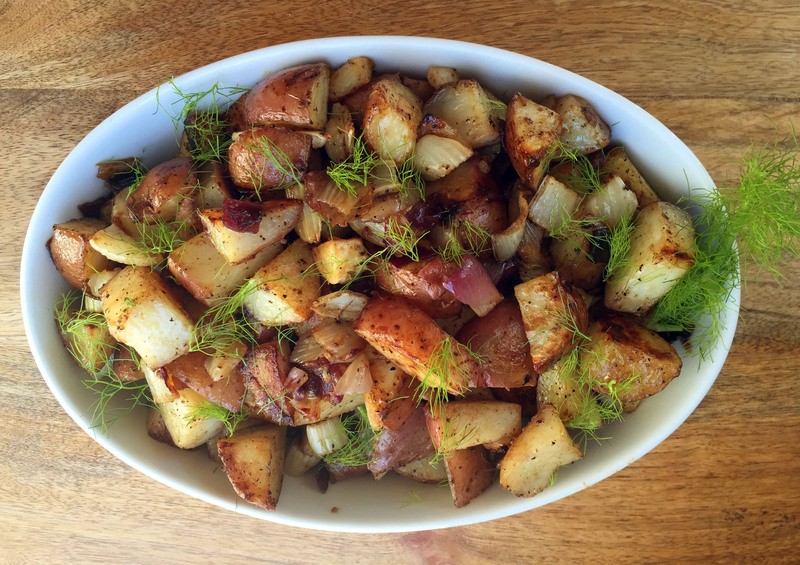 Add the maple syrup (and crushed red pepper – if using) and continue cooking until the fennel is caramelized (about 7-10 minutes). 3. Add the fresh spinach to the pan and cook until the spinach is just wilted. Remove from heat. 4. Grease a cooking sheet (or – even better – use parchment paper) & place your rolled-dough on it. I like to roll my dough out on semolina flour – as it adds crunch to the crust. Top with sauce, greens & cheeses. 5. Bake for about 10-12 minutes or until done to your liking. 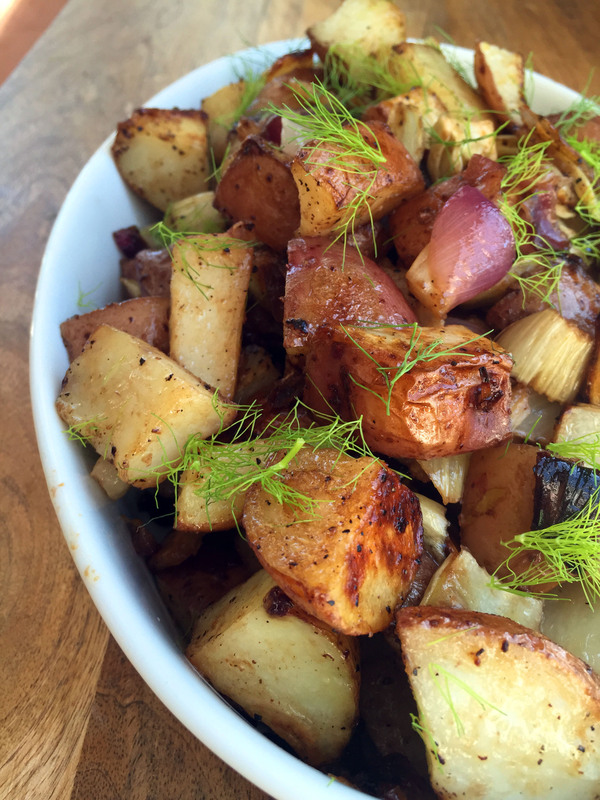 Garnish with fennel fronds & devour! Many people think they hate fennel. Even I can find it overpowering – but when sliced paper thin in a salad – or when roasted in a risotto – delicious – and two completely different animals. 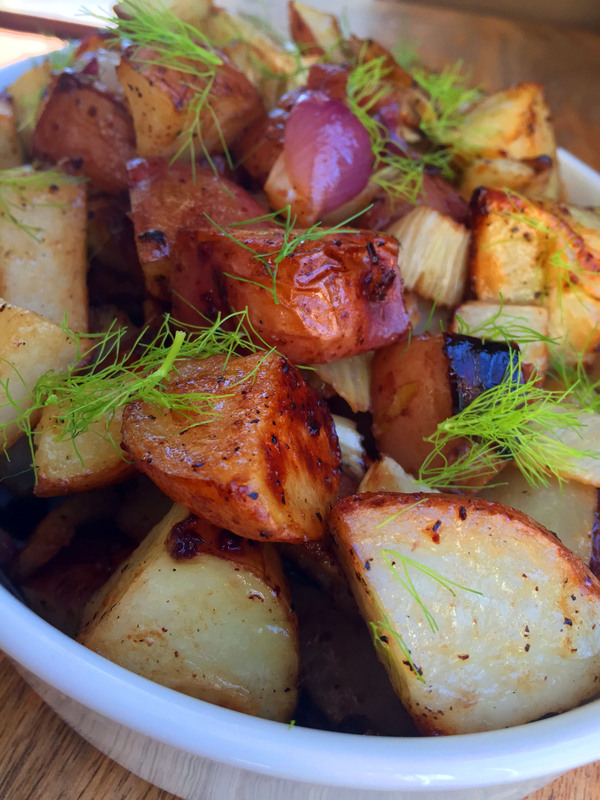 Raw fennel has that distinct licorice flavor but, roasted, it mellows out & gets soft & subtle – much like garlic. It doesn’t taste like garlic – it mellows the way garlic does – and takes on an almost creamy flavor. Lovely. 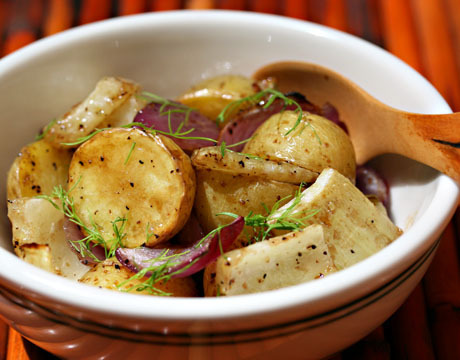 This potato dish is adapted from this – Recipe for warm potato, fennel and onion salad with balsamic vinaigrette – seen below. This stuff smelled so good while it was cooking – it was all I could do not to just sit in front of the cooked result & shove it, wholesale, into my face without regard for decency or the fact that it was to hot to eat. Really yummy! I promise! 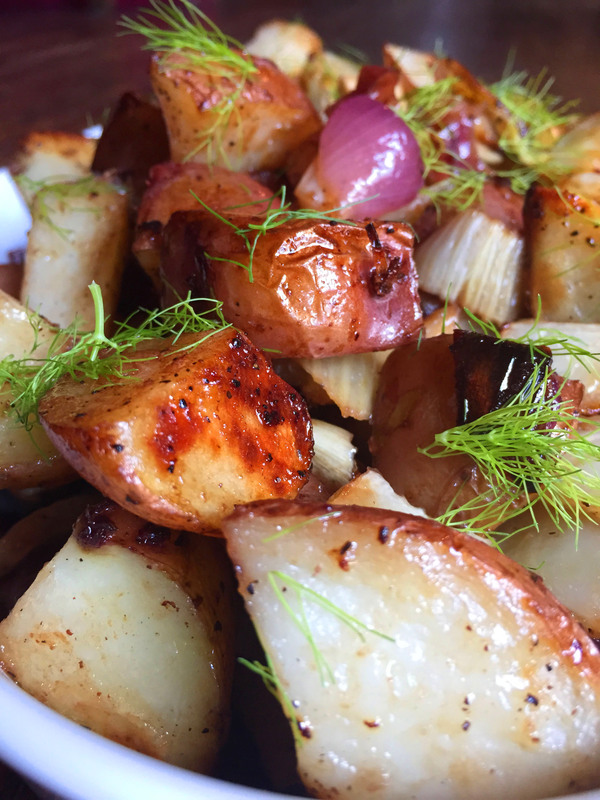 The red onions offer a bit of sweet/tang – as does the balsamic dressing – and the potato & fennel offer a creamy counterpart. Great warm or at room temperature. 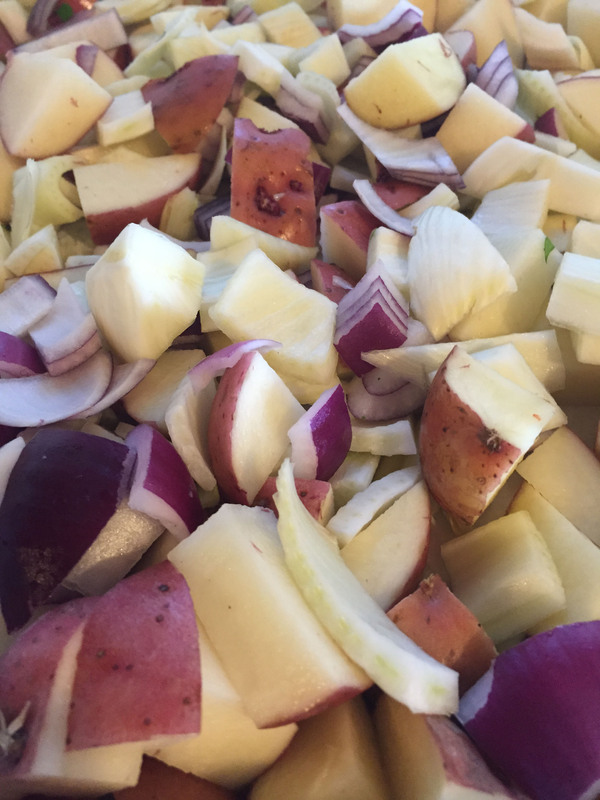 And – because there is no mayo – this potato salad does well sitting out at picnics, BBQs & buffets without giving you fears that everyone will soon drop dead from the salmonella you served them. People like it better, I have found, that they not get food poisoning at gatherings. True story. 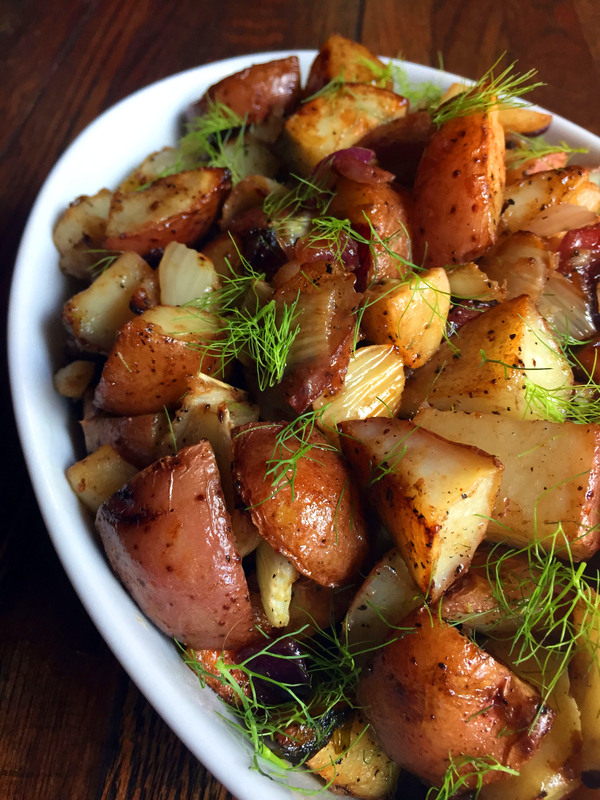 So – try this amazing potato salad! Raw – this filled a huge cooking sheet to capacity. Cooked – it shrunk considerably so – I would say these feeds 4-6 as a side – depending on appetites. I lined a large, rimmed cooking sheet with parchment paper but just naked on the pan is fine, too. 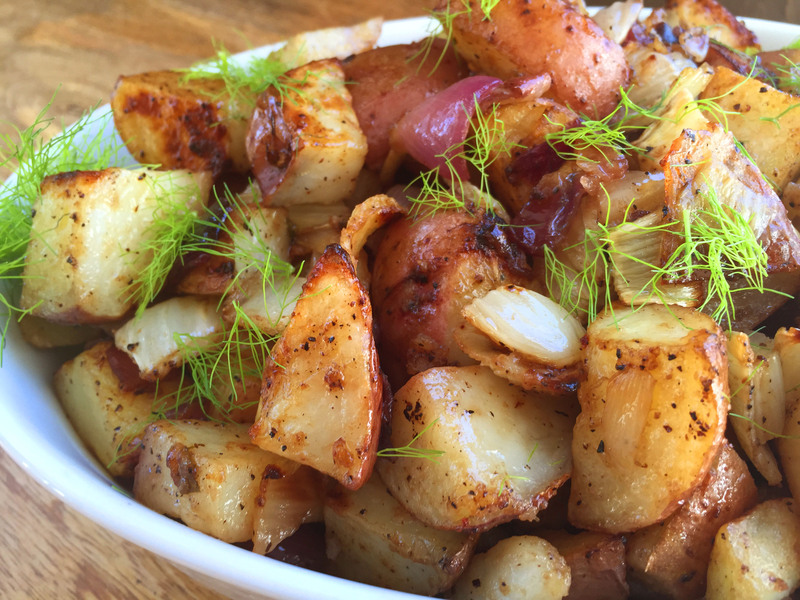 Put the potatoes, onions & fennel on the sheet & drizzle with olive oil. Add S&P. Toss – by hand – until everything has a light coat of oil and S&P. 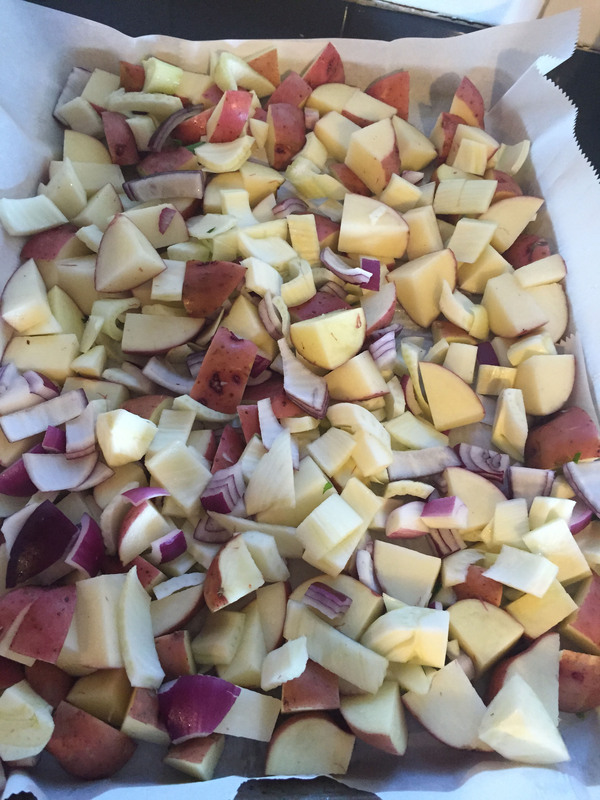 Roast 2o minutes, turn the vegetables and roast another 20 minutes – or until the potatoes are soft & browning. Meanwhile, in a far or bowl – mix the remaining ingredients. 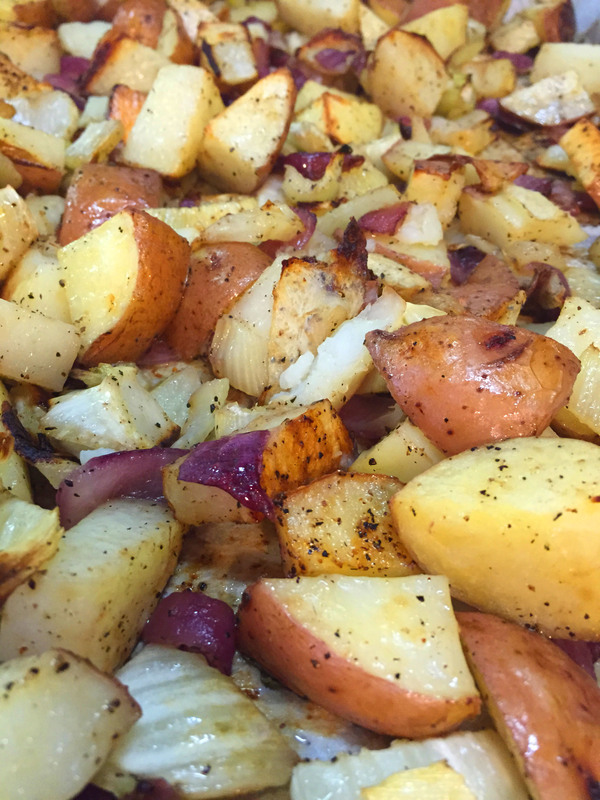 When the potatoes are done & still warm – toss with SOME – not all – of the balsamic dressing. Taste & add more as you like. 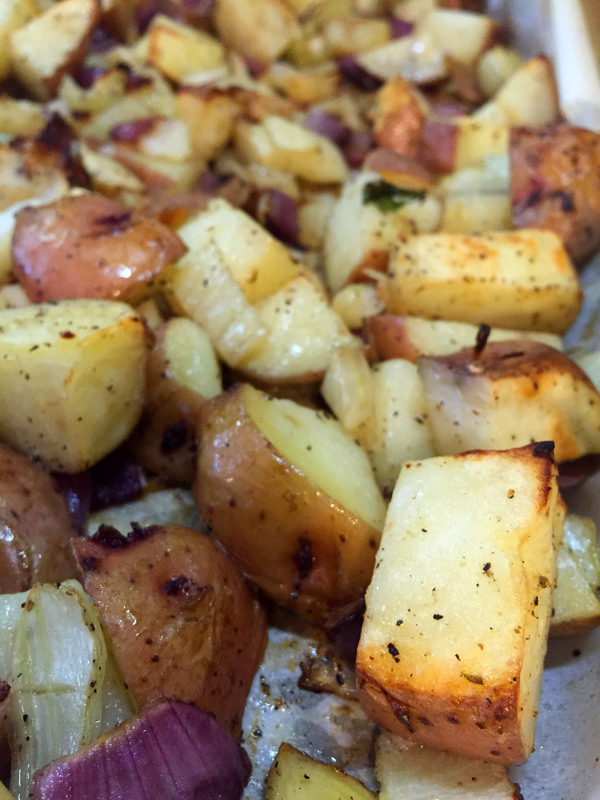 I only ended up using about half of the dressing & the potatoes absorbed it & had a lovely, light flavor. You might prefer a heavier hand – or even leave the dressing on the table for folks to add as they like. 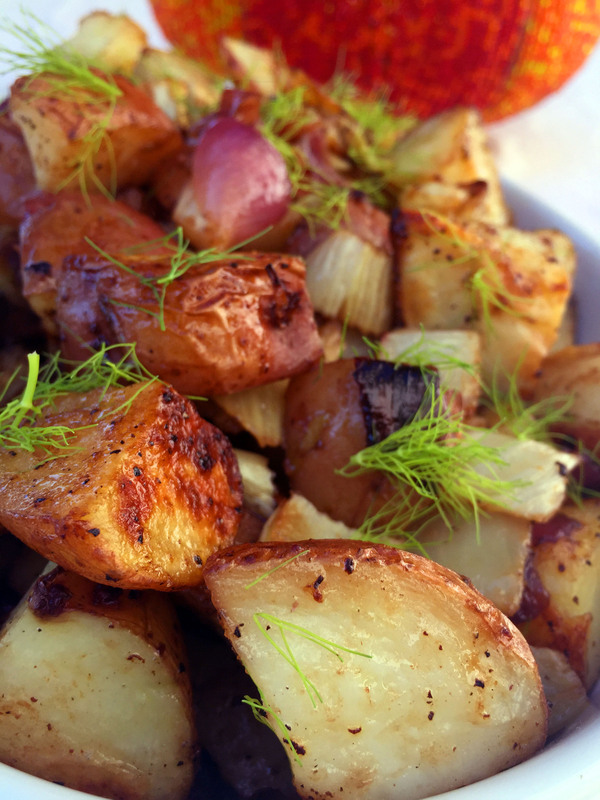 Garnish with the fennel fronds & serve warm or at room temperature.